I can’t quite believe it took us until July to make it to Syracuse’s bustling Saturday Regional Market this year. At least it was the start of July. My dear wife Karen and I took off early from the Little Bitty the first day of the Fourth of July Weekend to walk the sheds and take home what we needed and maybe what we wanted, too. At one veggie stand, we scored nice-looking and reasonably priced bananas, rhubarb and blueberries. That left strawberries and peaches to fill the produce checklist that came in my dear wife’s noggin’. We had plenty of stands left from which to choose. The strawberries were getting small, but we found some nice ones still from a farm in the northwestern ‘burb of Baldwinsville. The peaches were rock hard at one place, up from New Jersey. Pass. I found four softer versions undeclared of origin, four for two bucks. And then my nose led me to the soap stand. Karen knew right off it was the same woman she spotted selling at the Liverpool Craft Extravaganza in May, and the proprietor agreed. I picked out three faves, doubling up on cherry-almond, one of which sits out in the bathroom now. I sure wish I had the new scratch-and-sniff technology here for you. We did not buy any nuts. 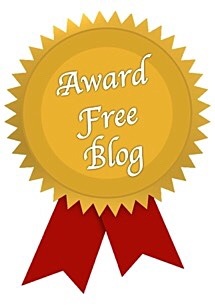 I did see some, though, so I wrote the irresistible headline anyway. And so I leave you with a gallery from the 90-minute stroll. Enjoy if you go today. If you don’t wish to walk the shed span. Hover over any gallery photo for a description. Click on an image for an enlarged slide show. 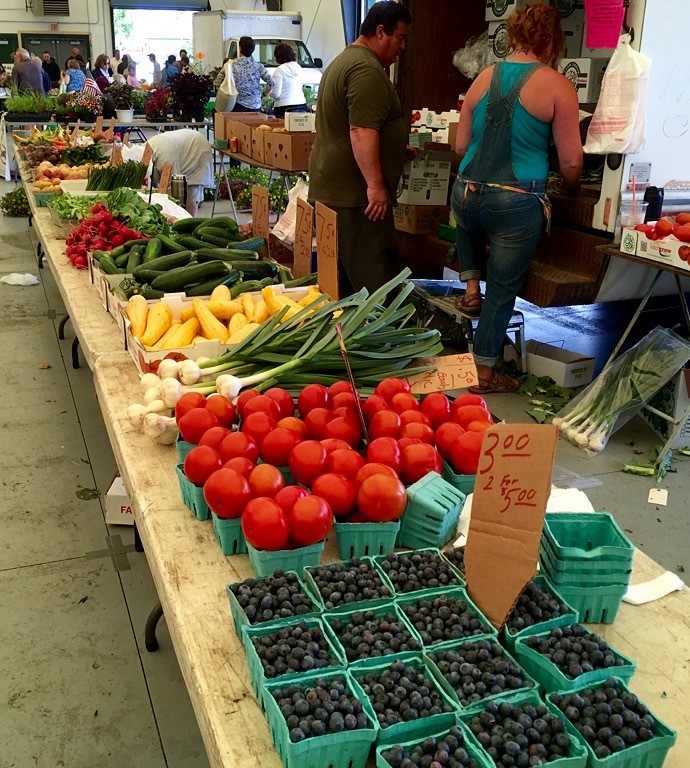 What do you like to buy from a Farmers Market? What do you like to buy from a Flea Market? 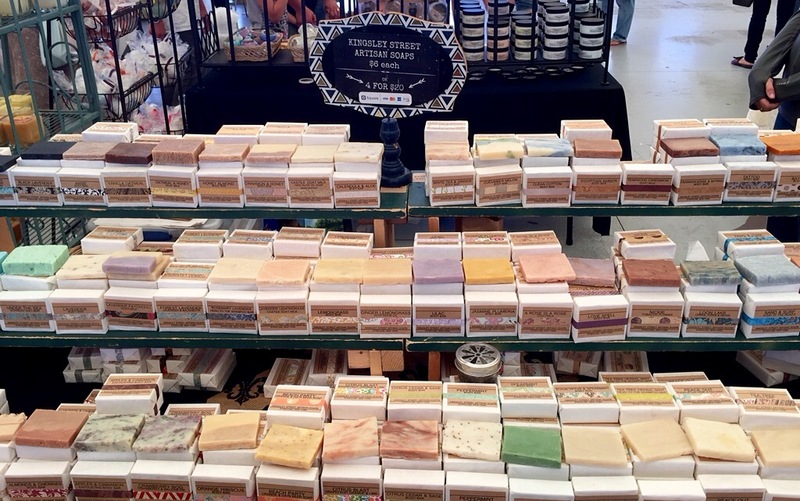 Do you like non-traditional scented soaps, and if so, what scents would you choose? Ohhh, fresh tomatoes and lettuce are my first purchases at a market.Then I look at the fruit – pears,peaches, and such. Then I check out the flowers – generally they are the biggest so I buy them last. Our markets generally don’t have hard goods like soap and such together with the fruit and veggies. We have artisan markets that sell such things along with paintings, curios, fabrics, and all other sorts of home and hand made items. We have a Sunday market in Chattanooga that looks like this one. They have food, crafts and music. It is always crowded too. We like to buy cheese, honey, nuts and the like. Sounds like fun and delicious stop, Tony. Enjoy! Yummy, Diana. I know it! Yes, somebody would collar you for a sale there, NBC. Ba-da-bing.